So I had planned on watching this movie with the lights off, the volume at 100 and wearing my ear buds…By the second half of the movie, the lights were back on, my ear buds were off and I had placed four saints statues on my laptop while clutching onto a crucifix. This is my review of The Babadook! If it’s in a word or it’s in a look, you can’t get rid of the Babadook. So make sure you have a Vatican exorcist on speed dial. Guys and gals, this is gonna be a tough review. I had to discard the notes I had written while watching the movie because they just didn’t do my real thoughts on the film justice. 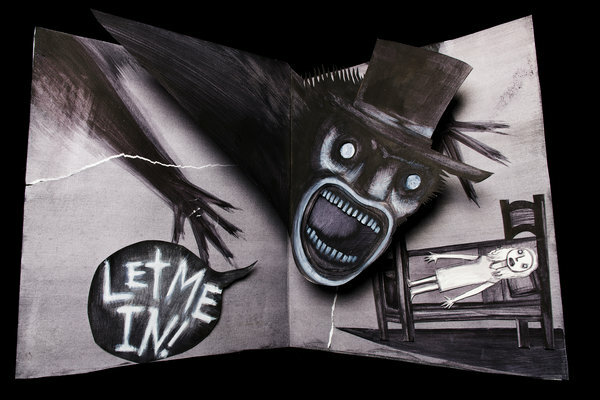 The Babadook is virtually perfect, and incredibly harrowing at the same time. An opening scene that will leave you speechless, great scene transitions and a tense, sorrowful atmosphere bring this movie to Pan’s Labyrinth level of greatness (and yes, I will be reviewing Pan’s Labyrinth in the near future). Give Essie Davis an Oscar right now. She is devastating as Amelia, one of the most miserable movie characters in recent memory. Amelia Vanak is a glassy-eyed widow whose husband was killed in a car accident while driving her to the hospital to give birth to their troubled son Samuel. Barely functioning with weary eyes and unkempt hair, the grief she carries and the weight of her stress over her wild child is made palpable to the audience. Noah Weiman plays the little boy Samuel, and as a preschool teacher in real life, I can say that he nails his role as a hyperactive, out-of-control child. I thought his character was well handled to where I could never hate him because his misbehaving is never intentional. The film is very clear that he thinks that by making slingshots and dart shooters (out of wood, by the way), he’s protecting his mother from monsters. He is legitimately unaware that he is the cause of Amelia’s misery. I don’t issue trigger warnings often because I feel our society will find any reason to use trigger warnings, but this is one of those times where a trigger warning is necessary. So here are my reasons for the trigger warning. #1. If you have or are currently experiencing grief, I would urge that you proceed with caution if you plan on watching this. This movie understands grief so well that it hits too close to home. I say this as someone who has experienced grief. I recently lost Sophie, my Old English sheepdog who I’ve had since I was a little girl. I used to watch movies with her sitting in front of the TV. She would just lay there and let me pet her while listening to me rant at bad movies and praise the good ones to high heaven. It’s only by the grace of God that I’m still able to sit through a movie at home without Sophie’s paw on my leg. The Babadook is unflinching in its acknowledgment that when you’ve lost a significant figure in your life, the next few days, months and years are riddled with confusion, emptiness and even the sense that you’ve lost your own purpose. #2. Speaking of pets, thank God for IMBD’s parental guide. I knew I was in trouble when I read that a dog has its neck snapped. If you’ve recently lost a pet (primarily a dog), then it might not be the right time for you to watch this. I couldn’t watch the actual scene of when the dog is killed. #3. IMBD’s parental guide mentioned that the movie might send triggers to anyone who has experienced childhood abuse, and that warning is warranted. The scene where Amelia holds a knife in front of Samuel while she verbally attacks him is disturbing even if you’ve never suffered abuse. Like in Silver Linings Playbook, the characters are well-written and fully realized that I became distressed for them when things go to Hell. Also the toxic, codependant relationship between the weak-willed Amelia and the unpredictable Samuel might bring back memories for people who have been in that kind of relationship. That all being said, don’t let those warnings deter you from The Babadook, a movie that tackles grief and the challenges of raising a troubled child with tact and grace. (Hears a “baba baba dook dook dook” knocking at the door) Now if you’ll excuse me, I gotta go throw holy water at my door to keep Mister Babadook away.